I am convinced. 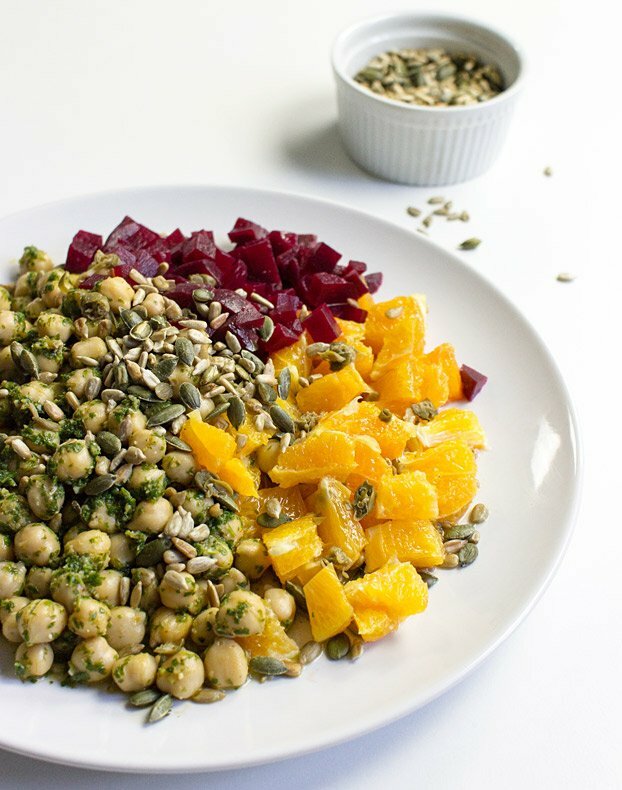 I’m convinced by beetroot, and I am convinced by this vegan chickpea salad. Allow me to explain. This culinary story begins not all that long ago – with the tasting of a beetroot dip. It was the first time I had tried beetroot for many, many a year, and I was determined to like it. I was so determined in fact, that although I really didn’t like the dip, I continued to eat it. I forced it down. It wasn’t a pleasant experience (I later found I’d made the dip incorrectly), and it was a fair old while before I summoned the courage to eat beetroot again. But testing, tasting and making recipes are what we do best, and I’m so glad I did. Beetroot is one of those hidden vegetables. It’s so well known, it’s hardly looked at as a superfood (I hate that word anyway, so that’s fine). But super it is. Are block-rockin’ beets a superfood? Plenty of new and relevant research exists with regards to beetroot – and the initial signs are very pleasing indeed. Not only are they high in folate, fiber and iron, they have also been seen to give athletes a moderate boost in sporting activities. Although more research is needed, it seems drinking some beet juice every now and then is a very, very sensible idea if you want to improve your sporting prowess. Beetroots have also been shown through study to reduce blood pressure, something that many of us must really pay attention to if we’re to keep on top of any health issues. So let’s not call beetroots silly words like superfood, let’s just say they rock and that we should be aiming to make them one of our 5 (or 10) a day. Back to our vegan chickpea salad – and how awesome it is. You can trust me and my initial dislike of beetroot to say that this recipe has more than changed my mind. It’s so damn tasty I can’t wait for the next time to make it (I’ve just bought all the ingredients again), and it’s so quick too. 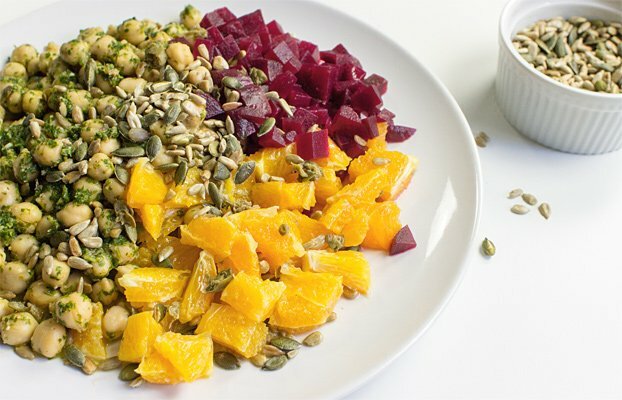 Who would’ve thought lime, orange and a little spice would go so well in a salad? Good food doesn’t need to be expensive, and this bowl of fresh and tangy nutritiousness is here to prove it. The main parts, chickpeas and beetroots, are extremely cheap, and extremely filling. 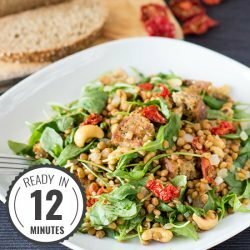 Whether you buy chickpeas already cooked and canned, or cook them yourself (we highly recommend this Instant Pot if you do), they’re a great source of fiber and protein. Beets can also be bought pre-cooked and will save massively on cooking time. If you’re looking for a vegan chickpea salad, then you really need to search no further – this is the one you need. Full of fantastic health benefits (chickpeas and oranges are a whole other great story!) 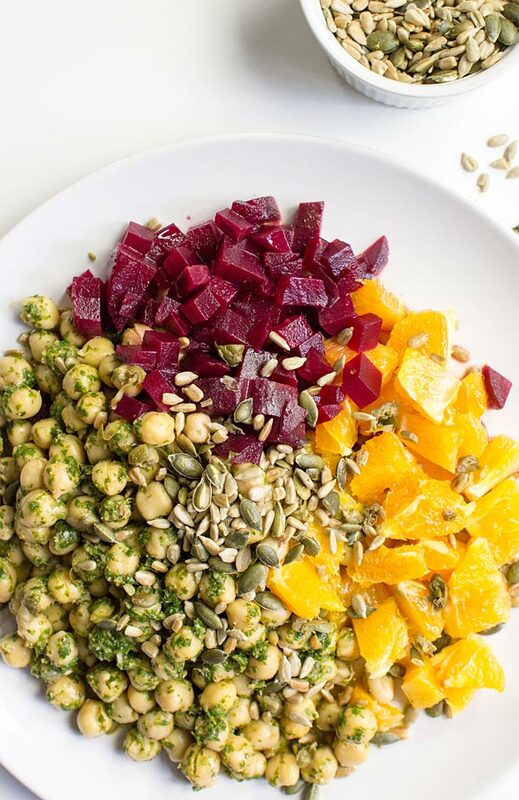 and a taste that beets the competition hands down – this is the salad the summer has been waiting for. 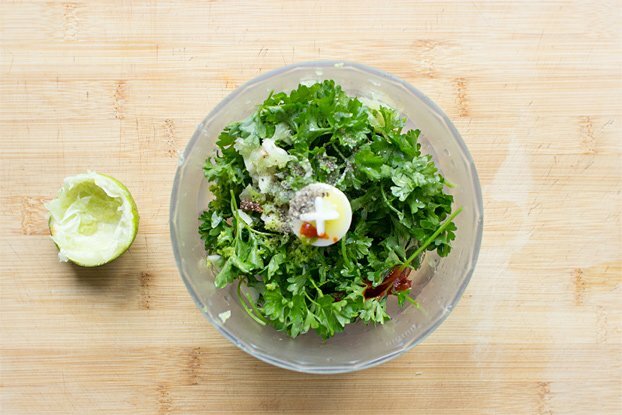 An animal friendly, fresh and tangy summer salad with some serious health benefits. It’s fresh and new, but still prepped within 15 minutes - awesome! Drain the chickpeas and give them a good rinse. Roast the seeds in a pan on medium heat until fragrant (no oil needed). 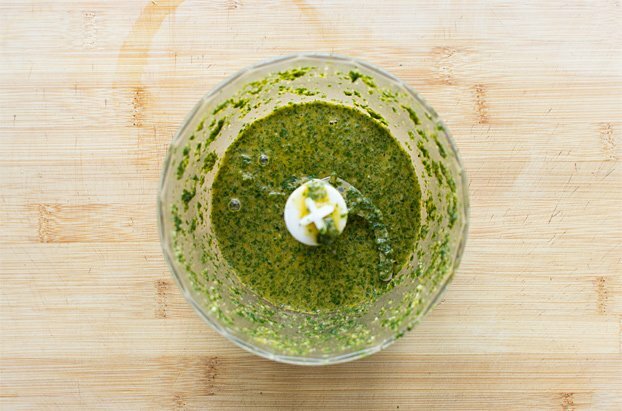 Chop the parsley, put it in a food processor or mortar. Add the lime zest, lime juice, garlic, hot sauce, olive oil, salt, pepper and blend it until it's green and smooth. 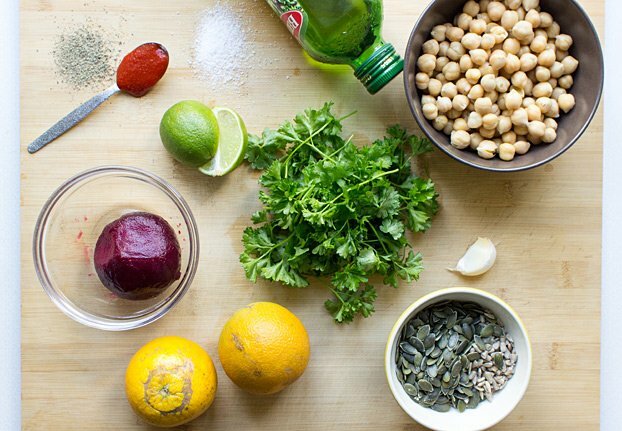 Put the chickpeas into a bowl, add the the ‘parsley dip’. Give it a good toss ;), add some salt to taste, and get it on a plate. Filet the orange (this video is cool, just slice the orange after you’ve peeled it), cut the beetroot into nice pieces and garnish the salad. If you like, add some capers on top, throw on the seeds, and enjoy. 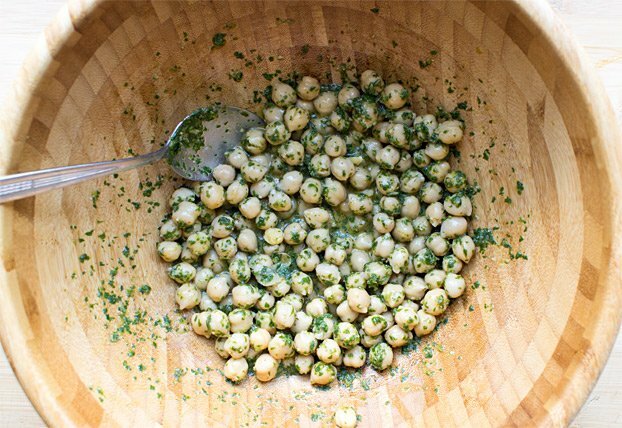 IF YOU LIKED THIS RECIPE: If chickpeas are your thing, then you’ve gotta check out this amazing chickpea and spinach recipe. 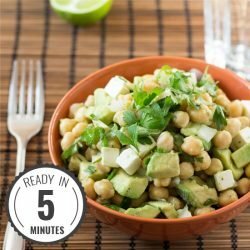 If you’re hankering after some healthy fats then this avocado chickpea salad might be right up your alley! A big thanks to our man Jansen for this legendary salad. 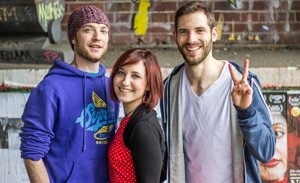 You need to open your restaurant soon, please! Yes yes yes !!! Beetroot is wonderful. As you say there is some research re beetroot and reduction of blood pressure – it also aids sleep – plus if you grow your own the edible leaves are full of great things. 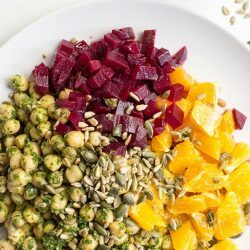 I am going to have a go at this combo – I think your recipes are spectacularly good – I only found this website yesterday and it ticks all my boxes! 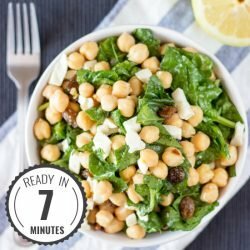 Chickpeas are my go to protein for vegan recipes – so versatile and sooo cheap. I do cook them from dried and freeze in batches – and for soups I just pop them in frozen and heat thoroughly. I am also big fan of fresh turmeric and will be grating some over the top – need to wear some gloves to handle the turmeric tho – it is anti inflammatory and great for my wrists.